Manfred (Sicilian: Manfredi di Sicilia; 1232 – 26 February 1266) was the last King of Sicily from the Hohenstaufen dynasty, reigning from 1258 until his death. 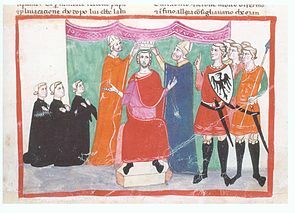 The natural son of the Holy Roman Emperor Frederick II, Manfred became regent over the kingdom of Sicily on behalf of his nephew Conradin in 1254. As regent he subdued rebellions in the kingdom, until in 1258 he usurped Conradin's rule. After an initial attempt to appease pope Innocent IV he took up the ongoing conflict between the Hohenstaufens and the papacy through combat and political alliances. He defeated the papal army at Foggia on 2 December 1254. Excommunicated by three successive popes, Manfred was the target of a Crusade (1255–66) called first by Pope Alexander IV and then by Urban IV. Nothing came of Alexander's call, but Urban enlisted the aid of Charles of Anjou in overthrowing Manfred. Manfred was killed during his defeat by Charles at the Battle of Benevento, and Charles assumed kingship of Sicily. Manfred was born in Venosa. Frederick II appears to have regarded him as legitimate, and by his will named him as Prince of Taranto. Frederick named Manfred's half-brother Conrad IV king of Germany, Italy and Sicily, but Manfred was regent of Sicily while Conrad was in Germany. Manfred, who initially bore his mother's surname, studied in Paris and Bologna and shared with his father a love of poetry and science. 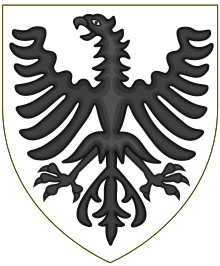 Coat of arms of King Manfred. In May 1254 Conrad died of malaria at the age of twenty-six. Manfred, after refusing to surrender Sicily to Innocent IV, accepted the regency on behalf of Conradin. The pope however, having been named guardian of Conradin, excommunicated Manfred in July 1254. The regent decided to open negotiations with Innocent. As part of a treaty made in September 1254, Manfred submitted, and accepted the title of Papal vicar for southern Italy But Manfred’s suspicions being aroused by the demeanour of the papal retinue, and also annoyed by the occupation of Campania by papal troops, he fled to the Saracens at Lucera. Aided by Saracen allies, he defeated the papal army at Foggia on 2 December 1254, and soon established his authority over Sicily and the Sicilian possessions on the mainland. In that year Manfred supported the Ghibelline communes in Tuscany, in particular Siena, to which he provided a corps of German knights that was later instrumental in the defeat of Florence at the Battle of Montaperti. He thus reached the status of patron of the Ghibelline League. Also in that year Innocent died, succeeded by Alexander IV, who immediately excommunicated Manfred. In 1257, however, Manfred crushed the papal army and settled all the rebellions, imposing his firm rule of southern Italy and receiving the title of vicar from Conradin. On 10 August 1258, taking advantage of Conradin's rumoured death, Manfredi was crowned King of Sicily at Palermo. The falsehood of this report was soon manifest; but the new king, supported by the popular voice, declined to abdicate and pointed out to Conradin’s envoys the necessity for a strong native ruler. The pope, to whom the Saracen alliance was a serious offence, declared Manfred’s coronation void. Undeterred by the excommunication Manfred sought to obtain power in central and northern Italy, where the Ghibelline leader Ezzelino III da Romano had disappeared. He named vicars in Tuscany, Spoleto, Marche, Romagna and Lombardy. After Montaperti he was recognized as protector of Tuscany by the citizens of Florence, who did homage to his representative, and he was chosen "Senator of the Romans" by a faction in the city. His power was also augmented by the marriage of his daughter Constance in 1262 to Peter III of Aragon. Terrified by these proceedings, the new Pope Urban IV excommunicated him. The pope first tried to sell the Kingdom of Sicily to Richard of Cornwall and his son, but in vain. In 1263 he was most successful with Charles I of Anjou, a brother of King Louis IX of France, who accepted the investiture of the kingdom of Sicily at his hands. Hearing of the approach of Charles, Manfred issued a manifesto to the Romans, in which he not only defended his rule over Italy but even claimed the imperial crown. Charles' army, some 30,000 strong, entered Italy from the Col de Tende in late 1265. He soon reduced numerous Ghibelline strongholds in northern Italy and was crowned in Rome in January 1266, the pope being absent. On 20 January he set southwards and waded the Liri river, invading the Kingdom of Sicily. After some minor clashes, the rival armies met at the Battle of Benevento on 26 February 1266, and Manfred's army was defeated. The king himself, refusing to flee, rushed into the midst of his enemies and was killed. Over his body, which was buried on the battlefield, a huge heap of stones was placed, but afterwards with the consent of the pope the remains were unearthed, cast out of the papal territory, and interred on the bank of the Garigliano River, outside of the boundaries of Naples and the Papal States. At the Battle of Benevento Charles captured Helena and imprisoned her. She lived five years later in captivity in the castle of Nocera Inferiore where she died in 1271. 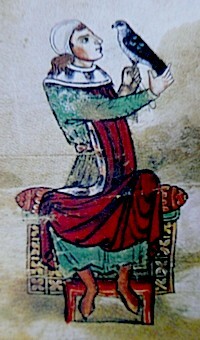 Manfred's son-in-law Peter III eventually became King Peter I of Sicily from 1282 after the Sicilian Vespers expelled the French from the island again. The modern city of Manfredonia was built by King Manfred between 1256–1263, some kilometers north of the ruins of the ancient Sipontum. The Angevines, who had defeated Manfred and stripped him of the Kingdom of Sicily, renamed it Sypontum Novellum ("New Sypontum"), but that name never imposed. Manfred was married twice. His first wife was Beatrice, daughter of Amadeus IV, count of Savoy, by whom he had a daughter, Constance, who was married to the heir to the Aragonese throne, the future King Peter III of Aragon, on 13 June 1262. Manfred's second wife was Helena Angelina Doukaina, daughter of Michael II Komnenos Doukas, ruler of the despotate of Epirus, who made this marriage to ally with Manfred after being attacked by him at Thessalonica. Helena and Manfred had four children: Beatrix, Henry [Enrico], Anselm [Azzolino] and Frederick. Helena and all her children were captured by Charles of Anjou after Manfred's death in 1266. Helena died in prison in Nocera in 1271. Her three sons with Manfred – the oldest only four years old at the time – were imprisoned in the Castel del Monte until 1299, when Charles II had them unchained and moved to the Castel dell'Ovo. Their living conditions were exceptionally miserable compared to the norm for noble prisoners. Kept in darkness, in heavy chains and with barely enough food to survive they became "blind and half-mad". The stress of the move proved too much for Fredrick and Azzolino, who died soon after. Henry survived another eighteen years, dying aged forty-seven in 1309, "half-starved, half-mad and probably blind". Beatrice in contrast had been released on the orders of the Aragonese commander Roger of Lauria following a battle off Naples in 1284. She went on to marry Manfred IV, Marquis of Saluzzo. The eldest son, Frederick, escaped his prison and fled to Germany. He spent time in several European courts before dying in Egypt in 1312. Manfred had at least one illegitimate child, a daughter named Flordelis. Contemporaries praised the noble and magnanimous character of Manfred, who was renowned for his physical beauty and intellectual attainments. In the Divine Comedy, Dante meets Manfred outside the gates of Purgatory, where the spirit explains that, although he repented of his sins in articulo mortis, he must atone for his contumacy by waiting 30 years for each year he lived as an excommunicate, before being admitted to Purgatory proper. Manfred formed the subject of dramas by E.B.S. Raupach, O. Marbach and F.W. Roggee. Three letters written by Manfred were published by J. B. Carusius in Bibliotheca historica regni Siciliae (Palermo, 1732). Manfred's name was borrowed by the English author Horace Walpole for the main character of his short novel The Castle of Otranto (1764). Montague Summers, in his 1924 edition of this work, showed that some details of Manfred of Sicily's real history inspired the novelist. The name was re-borrowed by Lord Byron for his dramatic poem Manfred (1817). ^ Lomax (2013, p. 440) gives Berthold's title as bailiff. Venning & Frankopan (2015, p. 335) asserts that Berthold was Conradin's regent over Apulia but Pietro Ruffo the regent over Sicily. ^ Barber 2004, p. 233. ^ Lock 2013, p. 179. ^ Runciman 1958, p. 27. ^ Abulafia 1992, p. 406. ^ Runciman 1958, pp. 28–29. ^ a b c d e Lomax 2013, p. 440. ^ a b c d e f g Chisolm 1911, p. 568. ^ Previté-Orton 1975, p. 696. ^ Fried 2015, p. 282. ^ Venning & Frankopan 2015, p. 335. ^ a b Kelly & Walsh 2010, p. 195. ^ Berg 1993, p. 113. ^ Domenico 2002, p. 25. ^ Runciman 1958, pp. 92, 94. ^ a b Runciman 1958, p. 94. ^ a b Runciman 1958, p. 43. ^ a b c Koller 2007. ^ Bennett & Weikert 2016, p. 144. ^ a b Gregorovius 2010, p. 537, n. 1. ^ Bennett & Weikert 2016, pp. 145–46. ^ Haverkamp 1988, p. 267. Abulafia, David (1992). Frederick II: A Medieval Emperor. Oxford University Press. ISBN 978-0-19-508040-7. Barber, Malcolm (2 August 2004). The Two Cities: Medieval Europe 1050–1320. Routledge. ISBN 978-1-134-68751-0. Bauer, Susan Wise (23 September 2013). The History of the Renaissance World: From the Rediscovery of Aristotle to the Conquest of Constantinople. W. W. Norton. pp. 402–. ISBN 978-0-393-24067-2. Bennett, Matthew; Weikert, Katherine (13 September 2016). Medieval Hostageship c.700-c.1500: Hostage, Captive, Prisoner of War, Guarantee, Peacemaker. Taylor & Francis. pp. 230–. ISBN 978-1-134-99612-4. Berg, Beverly (1993). "Manfred of Sicily and Urban IV: negotiations of 1262". Mediaeval Studies. 55: 111–136. Chisholm, Hugh, ed. (1911). "Manfred, King of Sicily". Encyclopædia Britannica. 17 (11th ed.). Cambridge University Press. Fried, Johannes (13 January 2015). The Middle Ages. Harvard University Press. ISBN 978-0-674-05562-9. Haverkamp, Alfred (1988). Medieval Germany, 1056–1273. Oxford University Press. Gregorovius, Ferdinand (2010) . History of the City of Rome in the Middle Ages. Vol. 5, Part 2. Cambridge University Press. Kelly, John Norman Davidson; Walsh, Michael J. (2010). A Dictionary of Popes. Oxford University Press. ISBN 978-0-19-929581-4. Koller, Walter (2007). "MANFREDI, re di Sicilia". Dizionario Biografico (in Italian). 68. Rome. Lock, Peter (15 April 2013). The Routledge Companion to the Crusades. Routledge. pp. 6–. ISBN 978-1-135-13137-1. Lomax, John (18 October 2013). "Manfred". In Richard K. Emmerson (ed.). Key Figures in Medieval Europe: An Encyclopedia. Routledge. pp. 440–. ISBN 978-1-136-77519-2. Matthew, Donald (30 July 1992). The Norman Kingdom of Sicily. Cambridge University Press. pp. 363–. ISBN 978-0-521-26911-7. Previté-Orton, C. W. (24 July 1975). Cambridge Medieval History, Shorter: Volume 2, The Twelfth Century to the Renaissance. CUP Archive. pp. 696–. ISBN 978-0-521-09977-6. Runciman, Sir Steven (1958). The Sicilian Vespers: A History of the Mediterranean World in the Later Thirteenth Century. Cambridge University Press. OCLC 930490694. Venning, Timothy; Frankopan, Peter (1 May 2015). A Chronology of the Crusades. Routledge. pp. 335–. ISBN 978-1-317-49643-4. Weiler, Björn K. U. (2006). Henry III of England and the Staufen Empire, 1216-1272. Boydell & Brewer. pp. 156–. ISBN 978-0-86193-280-1. Mendola, Louis (2016). Frederick, Conrad and Manfred of Hohenstaufen, Kings of Sicily: the chronicle of Nicholas of Jamsilla 1210-1258. New York: Trinacria. ISBN 9781943639069. OCLC 949866013. Momigliano, Eucardio (1963). Manfredi. Milan: Dall'Oglio. Wikimedia Commons has media related to Manfred, King of Sicily. This page was last edited on 30 March 2019, at 22:39 (UTC).